The fuse (short for 'fusible link') is an overcurrent protection device. Fuses are great for increasing safety, protecting power sources, protecting wiring from melting (do you really want to resolder everything? ), and possibly even protecting your sensitive electronics too. Whenever you work with high current applications that have a chance of 'evil' happening, I highly recommend you to use a fuse - if not to protect you from exploding lithium/cadmium/acid batteries, at least to protect your kitty when it decides to lick your robots' power supply wires . . .
How Does the Fuse Work? Remember, if a fuse blows, that means something is wrong with the electrical wiring. The most common mistake for people to make is to just replace the fuse without isolating the reason the fuse blew first. Remember, a blown fuse must be replaced with a fuse of the same amperage rating. The element in the fuse directly relates to the rating of your fuse. Thicker elements have lower resistance and higher heat dissipation - hence a higher current rating. The way to tell the rating of a fuse is to look for a number, usually representing the maximum current in amps the fuse can take before melting. Now how do you determine how many amps can be safely allowed in your circuit? Well, it depends on where in your circuit your fuse is located. Chances are you have the fuse located within your power regulation circuit, which means your fuse is connected directly to your battery. 1) For obvious reasons, no more current can go through the fuse than is suppliable by the battery. If the battery can only supply a maximum of 5 amps, it is pointless to have a fuse rated above 5 amps. Rating your fuse below the maximum suppliable current is enough to protect your power supply (aka prevent batteries from melting). 2) Now the next calculation is for protecting your wiring. Why would you want to protect the wiring? Can you afford to resolder any wires that melt? Sometimes it is actually easier to replace a damaged component than the wiring leading to it, such as with a car radio or IC's. Determine the current rating of the wires you use. Chances are the wires you are using are between 20 and 24 gauge. Typically this gauge rating is written on the wire itself. To protect your wiring, rate your fuse to be no more than the gauge current rating. 3) The last calculation, one that is much more dependent on your schematic and the electronic components you use, is for protecting the sensitive electronics. This level of protection might not be feasible, or even possible, for your application . . . But this is how to do it. Look at the datasheets of all the electronic components in your circuit, and write down the maximum peak power ratings and the voltages that will be applied to them. I say peak value under the assumption the fuse will melt before the electrical component when under duress. Remember that Power = Voltage * Current, or P=VI. Now divide each peak power rating by the voltage - this will give you the maximum current the component can recieve without melting. Lastly, sum up the currents of all the components. The reason why you sum is that the current is distributed among all the components in a normal situation. Use this number as your fuse current rating. Each type of fuse (and all other overcurrent devices) has a time-current characteristic which shows the time required to melt the fuse. Fuses are often characterized as fast-blow or slow-blow/time-delay, according to the time they take to respond to an overcurrent condition. Fast-blow fuses (sometimes marked 'F') open quickly when the rated current is reached. Ultrafast fuses (marked 'FF') are used to protect semiconductor devices that can tolerate only very short-lived overcurrents. Slow-blow fuses (household plug type are often marked 'T') can tolerate a transient overcurrent condition (such as the high starting current of an electric motor), but will open if the overcurrent condition is sustained. For protecting electro-mechanical devices (such as motors) and your power supply, you would want to use slow-blow fuses. For protecting electronics that are heat sensitive, you would want fast-blow types. Why Are Fuses Rated By Current And Not By Power? Its all about power dissipation, current means nothing alone, right? Sorta. The little element inside the fuse has a fixed known resistance. Since the manufacturer already knows the maximum power possible and the resistance of the element (determined by experimentation), neither which can be changed by you, all you need to know is the current rating. 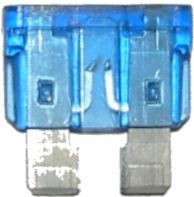 As well as a current rating, fuses also carry a voltage rating indicating the maximum circuit voltage in which the fuse can be used. 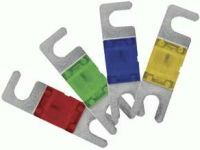 For example, glass tube fuses rated 32 volts should never be used in line-operated (mains-operated) equipment even if the fuse physically can fit the fuseholder. As long as the voltage is rated higher than the expected voltage, its ok. Below are examples of glass fuses and glass fuse holders. Sub-miniature fuses are for small electronics and may be rated as little as 50mA. These may have wire leads or may be fitted into small two-pin sockets. Sub-miniature (shown below) and pico fuses may be directly soldered to a printed circuit board. Circuit breakers are typically more expensive and much larger - both big disadvantages for the robotics hobbyist. They do have the ability to be easily reset however, great if having spare fuses around could become costly or a hassle. 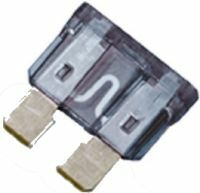 It is possible to replace an ATO-type plug-in fuse with a circuit breaker that has been designed to fit in the socket of a ATO-sized fuse holder. These circuit protectors are more still expensive than a regular fuse though. 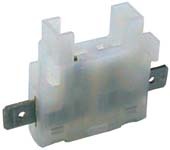 So-called self-resetting fuses use a thermoplastic conductive element that opens the circuit on overload, then restores the circuit when they cool. These are useful in aerospace applications where replacement is difficult. A common kind is the Polyswitch self-repairing fuses. A thermal fuse is often found in consumer heating equipment such as coffee makers or hair dryers. These contain a fusible alloy that opens when the temperature is too high due to reduced air flow or other fault.